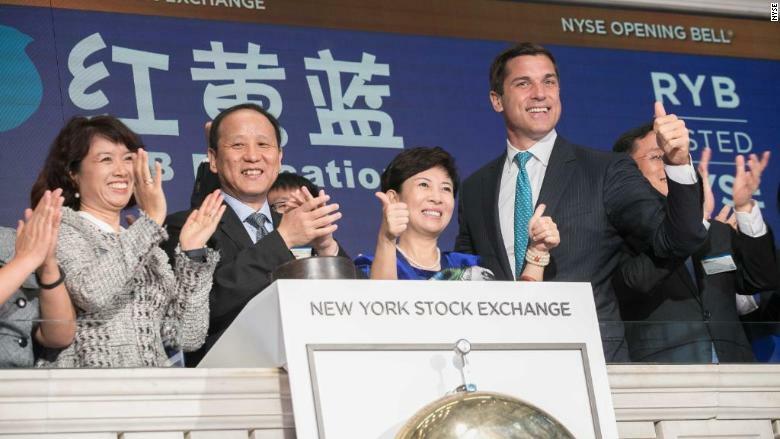 RYB Education representatives ring the New York Stock Exchange opening bell on the company's first day of trading in September. A Chinese education company whose shares trade in the U.S. is grappling with a child abuse scandal that has outraged parents across China. Two months after its stock popped 40% on its debut in New York, RYB Education (RYB) is on the defensive. Police in Beijing have detained a teacher and are investigating allegations that children were drugged and molested at one of RYB's kindergartens. The company is one of many seeking to cash in on China's private education boom -- of which kindergartens are a big part. Consulting firm Deloitte estimates that the country's preschool industry will be worth $82 billion in 2020, up from $58 billion last year. But government regulations and the number of qualified teachers haven't kept pace with the rapid expansion. The scandal unfolding at RYB is part of a worrying trend. Since 2010, there have been more than 60 child abuse incidents at kindergartens in China, according to Chinese news organization Caixin. In a research report in July, analysts at brokerage DBS Vickers highlighted recent abuse cases at private kindergartens, including kids being beaten by teachers or fed rotten food. "As there are not many requirements and regulations on kindergarten teachers, common private kindergartens or even some premium ones are very likely to hire non-qualified teachers to cut their costs," analysts Manyi Lu and Dennis Lam wrote. "Insufficient government supervision has worsened the problem," they added. RYB has more than 1,000 kindergartens and play-and-learn centers in 300 cities and towns throughout China. The company's stock plunged nearly 40% Friday. It has since recovered some of those losses, but remains far below the price at which it was trading before the scandal came to light. During a call with investors on Friday about the abuse allegations, RYB executives pledged to improve surveillance and security standards. They maintained that the safety of children is the company's utmost concern. RYB said in a further statement Monday that it will set up a special task force that will "perform a thorough self-inspection across all RYB teaching facilities and review and inspect all practices in these facilities." Past incidents involving RYB kindergartens included two cases in northeastern China, where four RYB teachers were each sentenced to more than two years in prison for abusing 17 children. In China, children often attend kindergarten for three years before starting school. Because preschool education isn't compulsory, the government doesn't have to make big investments in the sector. As a result, the demand for kindergartens far outstrips supply and private businesses have stepped in. Quality teachers remain hard to come by, though. There are 44 million preschoolers in China, and only 2.2 million trained kindergarten teachers, according to state-run broadcaster CGTN. The shortage hasn't stopped the industry expanding. The number of private kindergartens has risen from 115,000 in 2011 to more than 150,000 last year, according to Deloitte. It predicts there will be more than 180,000 in 2020.